The AdderLink XDIP nodes can be configured as a simple extender, distributed KVM switch or KVM sharer or any combination up to 8 computers and 8 users (each user does not necessarily need to be connected to the same 8 computers). XDIP runs on a standard IP network and enables users to extend and manage their computers with ultra-low latency, HD video and stereo audio. Note: it is a single unit that can be configured to be a transmitter or receiver, so you will need two for an extender pair. 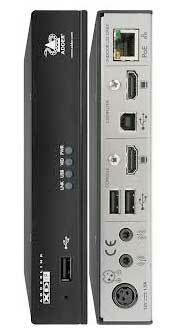 This PoE model is powered by PoE or an optional external PSU. The AdderLink XDIP nodes can be configured as a simple extender, distributed KVM switch or KVM sharer or any combination up to 8 computers and 8 users (each user does not necessarily need to be connected to the same 8 computers). XDIP runs on a standard IP network and enables users to extend and manage their computers with ultra-low latency, HD video and stereo audio. ipeps-DA model has feed through port that provides local KVM console access. 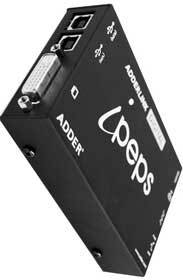 A powerful and flexible KVM-over-IP product contained with in a palm sized unit, the AdderLink ipeps enables computer access from anywhere in the world, securely and remotely via the Internet or corporate network. The AdderLink ipeps uses Real VNC client software that is specifically designed for secure, high performance KVM-over-IP applications. Manage your computers from anywhere in the world with the AdderLink IP. The AdderLink only requires a KVM (keyboard, video, mouse) connection to your computers and doesn't need any software to be loaded on your servers. ALIP-GOLD: Adderlink Gold IP - Secure dial-up access to your cmputers or servers.